Friends often ask me for appetizer recipes. Something new and out of the ordinary. Well, here ya go … make these, make these! Just make sure I make the invite list. If you’re going to make lamb meatballs, this is the way to do it. Little flavor bombs packed with garlic, onion, parsley, oregano, mint, cumin, cinnamon, and nutmeg. A beautiful combo of warm and earthy spices. Take a look at the instant element of presentation these little hand-held beauties provide … a welcoming sight to any guest. So simple, so delicious, so pretty, and so unique. 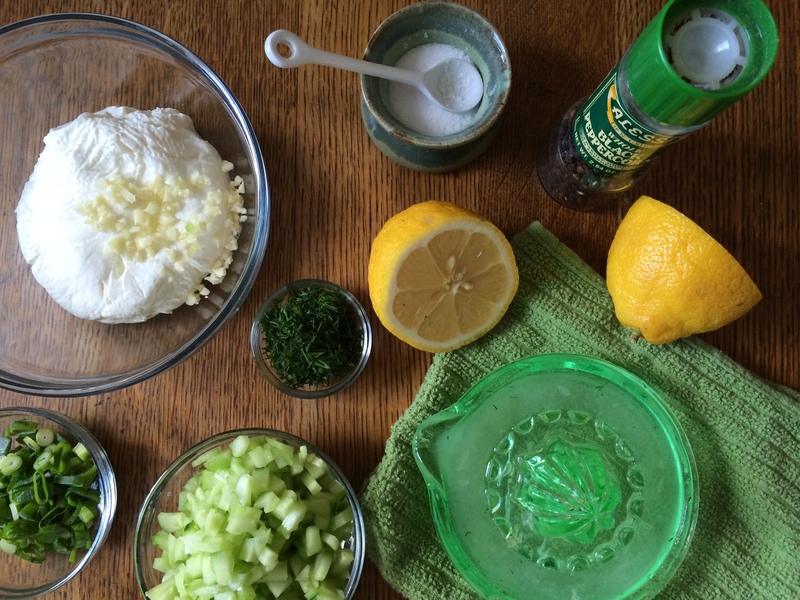 Don’t forget the homemade tzatziki sauce! In a medium skillet, sweat onion and garlic in 2 tsp of olive oil over medium heat until translucent, about 4 minutes. Let cool and set aside. 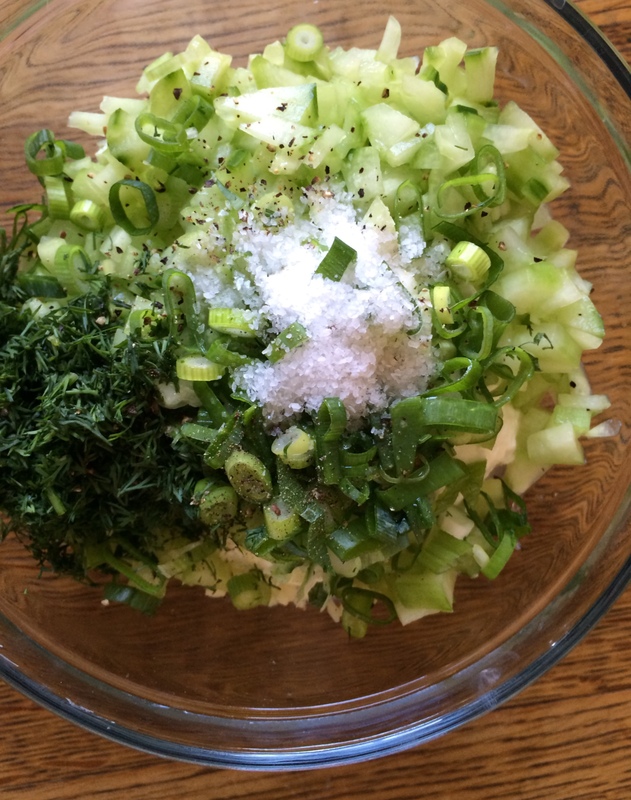 Combine the rest of ingredients in a medium sized bowl. Add cooled onion and garlic mixture and mix well. Form mixture into 20 meatballs. Add 2 tsp of olive oil to a saute pan and sear meatballs on all sides for 5 minutes, rotating them as they brown. Do not overcrowd your pan. You will most likely have to brown the meatballs in 2 batches. Add browned meatballs to a sheet tray and bake for 8 minutes or until cooked through. 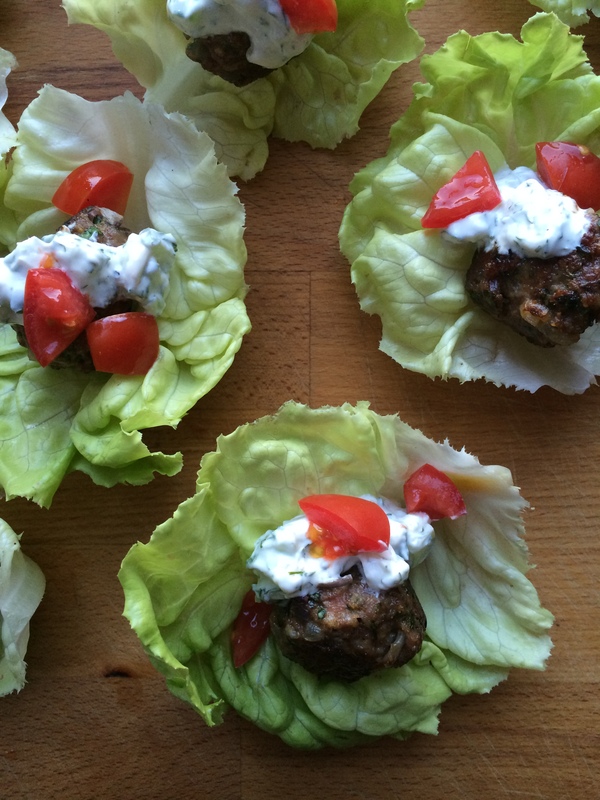 Serve in lettuce cups with tzatziki sauce and chopped tomatoes. Note: I like to use fresh herbs whenever possible, but dried herbs work as well. These were delicious! 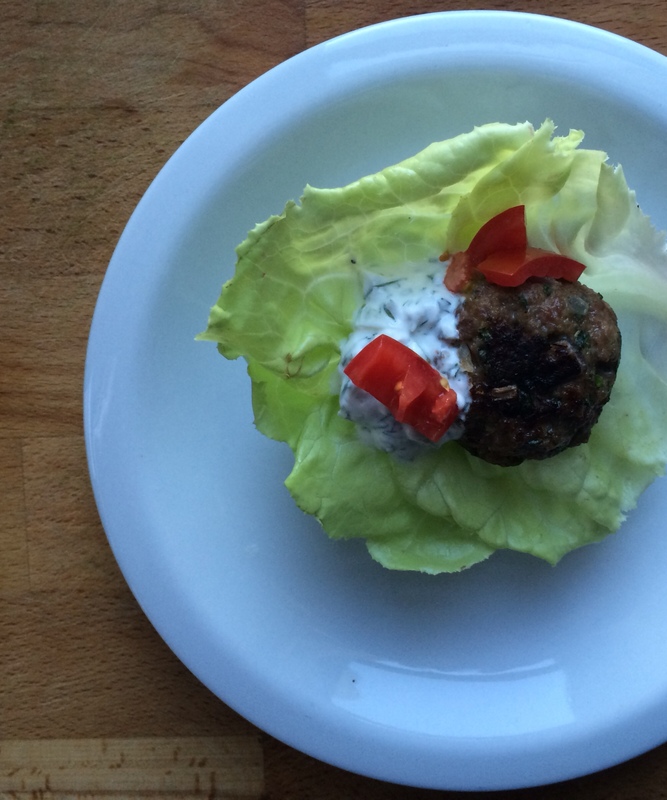 I really enjoyed the actual process of making the meatballs and anything served in a lettuce cup (sans carbs) is a winner in my opinion. I didn’t have time to wait for the yogurt to strain and I used 0% Greek yogurt, which I was a little nervous about, but it turned out really well and we LOVED it. Happy One Year Anniversary EAC! I love the process of making meatballs too, it’s therapeutic. I often times skip the straining process when I make tzatziki sauce as well, the sauce just ends up being slightly thinner. Also, 0% Greek yogurt works just as well. Glad you enjoyed the recipe! Emily, I love this recipe and especially the sauce. 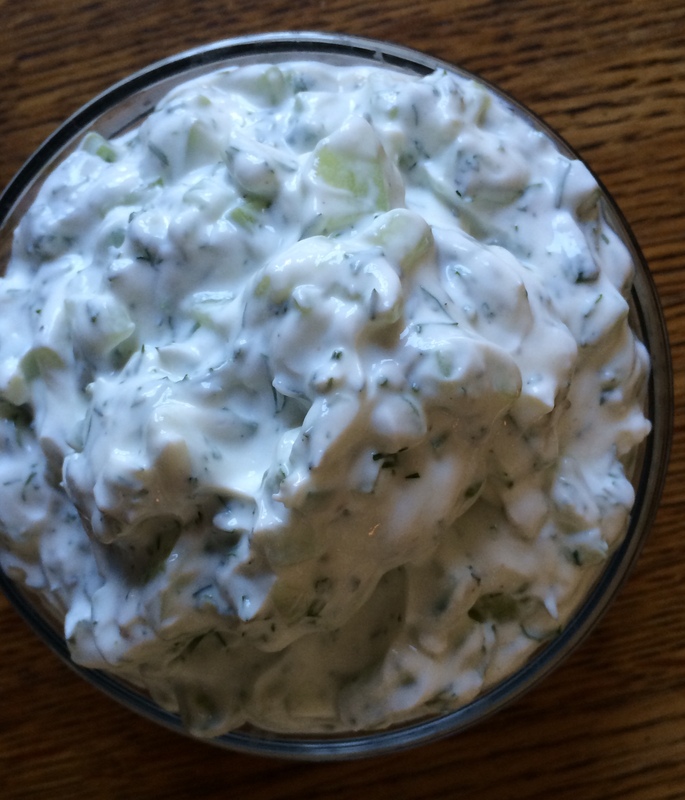 I am from Germany and we put the Tzatziki Sauce on all of our grilled meats and everything else, like freshly baked breads…..great job! 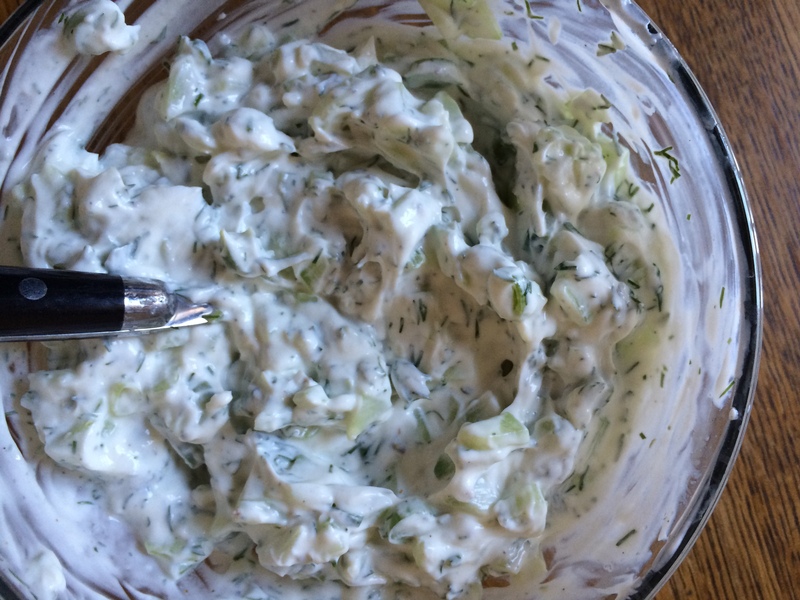 We love Tzatziki Sauce in my house too! Thanks!! Adorable! I love mini foods. Now the big question: is it one bite or two? I love mini food too! These are definitely 2 bites.